These large, pure old-gold yellow flowers open in late June to early July. Rich, cheery color and easy to mix with other varieties in the garden, plant them just in front of the later flowering and taller 'Conca d' Or' or 'Lesotho' for succession of bloom. Light fragrance. 3 to 4 feet. In the left-center backgound is a clump of Eucalyptus trees that Dianna had planted some 18 years earlier that were killed off during a particularly cold winter when night temps. dropped to 3F. They have since been cut into blocks and are now being used for wood turnings by Bob during the winter months when the field does not demand his time. 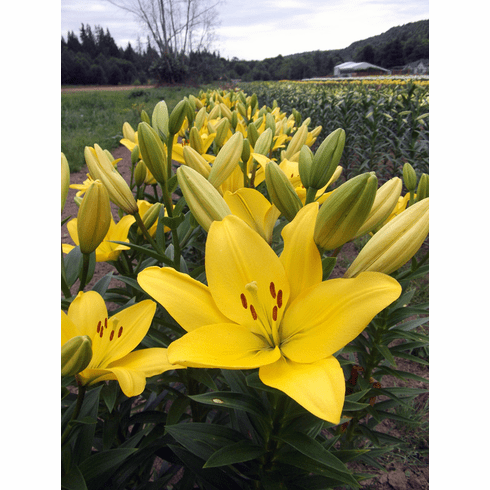 Bulb Size - Our standard for bulbs of this Easter x Asiatic Hybrid Lily Bulb (Fragrant) cultivar ranges from Premium-size (16/18 cm) to Exhibition-size (over 20 cm).